One of the main features of Google+ is the ability to engage in group video chat sessions called Hangouts. I can see some interesting uses for Hangouts both personally and professionally, so for today's 30 Days With Google+ I am exploring how Hangouts work. On the right side of my main Google+ Streams page there is a big green button that says "Start a Hangout". I clicked it, and my webcam came to life as a preliminary Hangout console opened up. Check your hair and make sure your mic works before starting a Hangout. Interestingly, I was playing music on my PC the first time I started a Hangout and Google+ subdued the music. It didn't mute it--just turned it down so it was much less audible and less likely to interfere with the Hangout. This first screen gave me an opportunity to make sure my webcam is working, and check the microphone and speakers to make sure all of my equipment is functioning properly for the Hangout. There is a gear icon at the bottom to open up the settings if you need to troubleshoot the audio or video, or you want to switch to a different camera, speakers, or microphone. 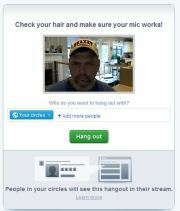 This screen is also where I can choose which Circles or users to invite to join my Hangout. I can add Circles, or specify individuals, or leave the Hangout invitation open to the Public if I choose. There is a maximum of 10 active participants for a Hangout, though. If I invite a Circle with 50 people in it, the first 10 will be able to join the Hangout. After that, others can only jump in if one of the active participants leaves the Hangout to make room. Once I choose who to Hangout with, I click the green "Hangout" button and the Hangout begins. I can see my own video feed at the bottom, and a lonely robot holding a bunch of ballons beneath a message that reads "No one is here right now" while I wait for others to join. Who Can See the Hangout? The Circles or people I invite to a Hangout will see a post in their stream letting them know that there is a live hangout going on, as well as who is currently participating in that Hangout. If I try to start a Hangout after I've already been invited to one, I get an alert reminding me there is already a live Hangout and asking if I'd like to join that one instead.